Ryan develops this special interest in balloons, basket balls, footballs, guli, anything round in fact. He just loves playing with them. Imagine the very first word he would say the moment he wake up will be – “ball”; the second word also “ball” and he’ll go ball ball ball….. until we give him the balloons/balls in his cot. When it comes to malling, the word that never leaves his mouth is – “ball.. ball.. ball..ball.. balllllllll” and he’ll point to us the balloons, balls, and whatever whatever round shape figures he spotted in the mall. Thank goodness nowadays he longer gets cranky when his wishes/desires for one were not met. Pretty manageable now. Probably knowing he has tons of them at home. When I say Ryan really loves his balloon.. I meant it. Check out what stunt he’ll perform with his two balloons. A clip of a little drummer in the making. 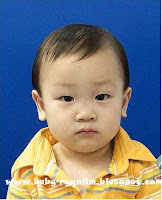 We brought Ryan to KLCC last Sat to have his passport pic taken. Check out the serious look on the usual little cheeky boy of mine. Daddy was carrying him while mummy became the clown behind the camera man trying to get the little one to stay focussed. Very obvious from the pic, Ryan did not find the mummy funny at all. Ryan behaved really well throughout the process. Somehow we tend to worry too much that he will be cranky, will not cooperate, will not do this, will not do that.. but he always surprises us with just the total opposite. It’s exactly what happened when we brought him for his haircut last time. So cooperative, so behaved. Well done baby. Being the only toddler at home, it’s hard for me to gauge how well Ryan behaves when another little one is around. So, the only source of info as such would be from nanny who also baby sits her niece who is 6 months old. Last week nanny shared with me Ryan’s tender loving side stories. According to nanny, she never taught Ryan these but somehow Ryan knew what to do at times as such. He must had picked it up unconsciously from nanny. What happened was last week, nanny spotted Ryan shoving the pacifier into the baby’s mouth whenever she cries. If the crying does not stop, Ryan would then pat pat the baby girl’s chest softly, and then knock his head towards the girl’s. Well, in case you’re wondering why knocking the head, head2head knocking is actually Ryan’s way of showing his love since young. Whenever we say the word sayang example, ‘sayang’ mummy, ‘sayang’ daddy, Ryan would knock his head towards ours. Nanny said she spotted Ryan doing that on several occassions so it’s not a fluke shot afterall. When I learnt that, I feel so proud of my little baby. So sweet; not quite the little monster at all……….. Maybe he’s really for a little DiDi/MeiMei? Blehhh…. I posted on Ryan’s Hep A vaccine earlier. Some mommies asked me how come Hep. A is not listed on their schedule. I guess different paed would have different interpretation of the need of which vacine is compulsory and which is good to have. Below is Ryan’s immunisation list which I’ve been following. Hope it serves a good reference for all….